I always get excited for new brewpubs opening. 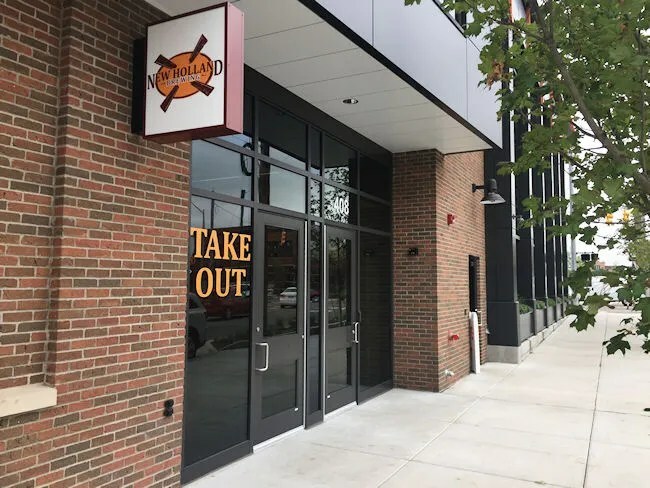 It doesn’t matter if it’s Kalamazoo or Grand Rapids or anywhere else in West Michigan. Any place that serves delicious beer and just as delicious food is always going to be a high priority for J and I. This past weekend, J wanted to go to the Tanger Outlets in Byron Township. The only other time we’ve tried going to the outlets L had a massive meltdown in the Gap and we had to make a run for the car to get her out of there. We decided to try again by telling her there is a playground that she could play at while Momma went shopping. Anytime we go to Grand Rapids as a family, we try to knock off one of the many, many places we want to eat at. It just so happens, one of those high priority ones popped up for us. It actually made the decision to take the road trip to the outlets that much easier. 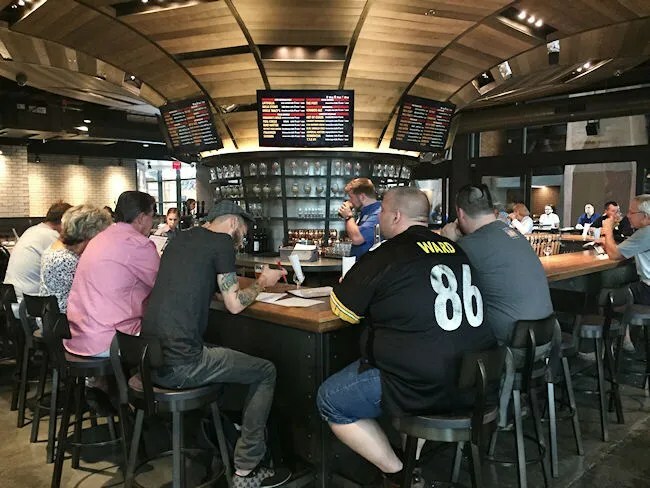 The Knickerbocker Brewpub & Distillery doesn’t have it in it’s name, but it’s part of a very successful West Michigan beer company. 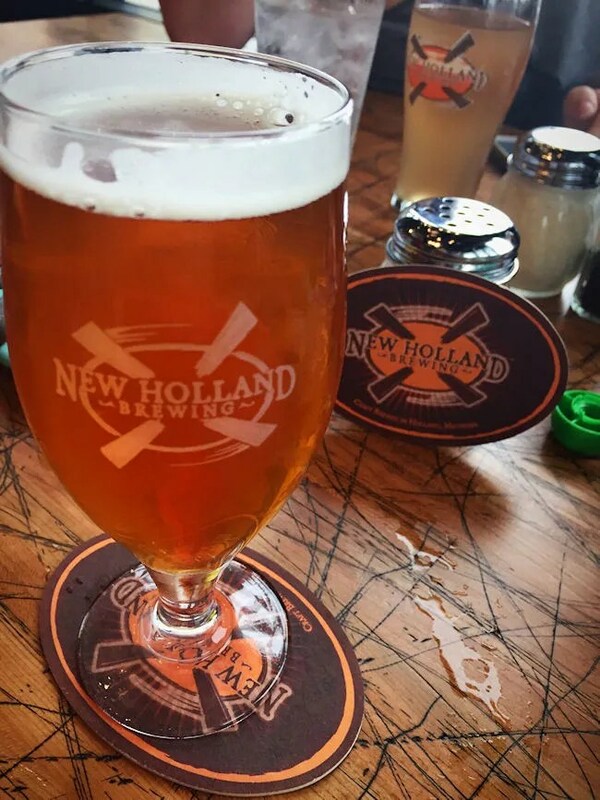 The brewpub is New Holland Brewing’s second location. They’ve opened a massive brewpub, new offices, retail space, and production floor with a three vessel 10 BBL with six fermenters. It also has two distillers for their artisan spirits. The building is just west of downtown Grand Rapids in what is known as the “West Side.” The building is an original build that looks sort of out of place in this location right now. The word massive barely does it justice. It was just under a year ago that they broke ground on this spot just a couple years after speculation that they would be opening a brewpub in the Downtown Market. The brewpub, pays homage to it’s home in Holland by naming the brewpub after the Knickerbocker Theater at Hope College. Parking at this new location is a little rough. 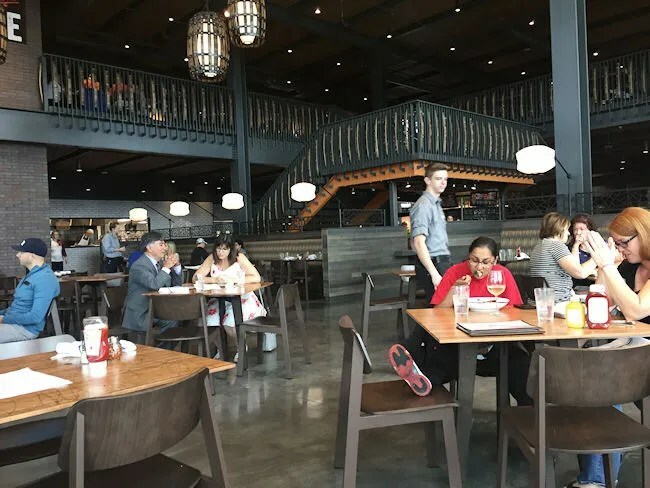 The restaurant is pretty large, but parking near the site is not. There is a lot behind the building, but it’s not very big. There’s some street parking (which we actually got lucky and found), but there’s not a lot. New Holland actually put a map on the Knickerbocker site to direct you to city lots which are all a couple of blocks away. If your planning on visiting at peak times, expect to walk a little ways from wherever you can find a spot to park. The entrance is a little overwhelming the first time walking in. 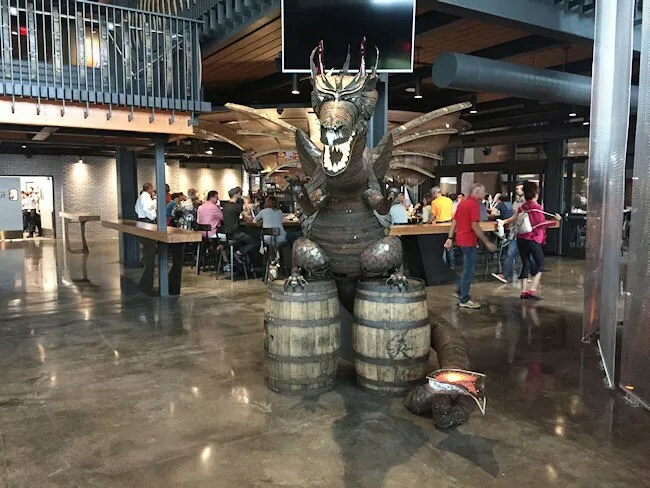 A giant metal dragon greats you at the door on the way to the host stand which is at the end of a large waiting area. To the right is the gift shop and bar area. To the left, a large dining room and some patio seating along Broadway Avenue. Straight up, another dining area with a speakeasy that was being used for a private party. Beyond what you can see when you walk in, there’s a four story beer hall and an outdoor beer garden with a stage for entertainment. The bar at The Knickerbocker was pretty full when we stopped in at 1:30 on a Friday afternoon, but it was also the first weekend of Artprize, so that probably had a little to do with it. The bar is a square that goes around a circular column in the center. 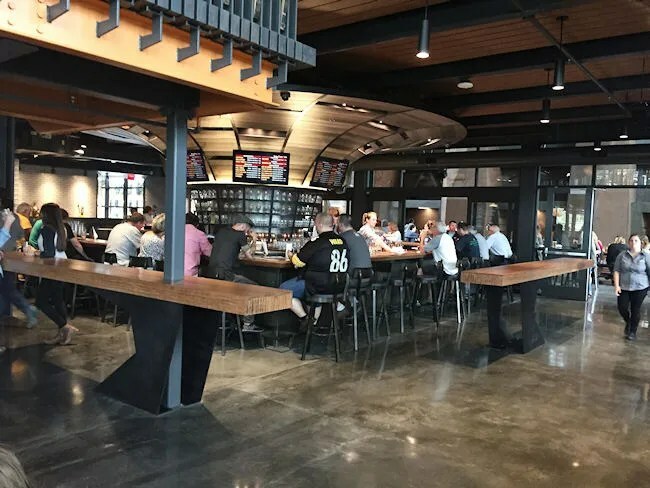 TV monitors hanging above the glass display cases list the beers on tap. There’s also some freestanding walk up bars in the space where you can set your beer down on busy nights when you can’t get a seat at the bar. We went straight to the host stand and asked for a table for the four of us. We were shown to a table in the back corner of the space looking out over Bridge Street. As we sat down, the hostess left us three menus and the drink menu while someone else brought a high chair for B. A kid’s menu was never offered for L and there is nothing in the regular menus that show they have one. I have a suspicion there is because I heard a waitress at a different table say something about a “kid’s cheeseburger” when she set a plate down, but we made due without if there is one. As much as we like the flagship location in Holland, we don’t get to Holland as a family very often. I do drink quite a bit of their beer and love the varieties of Dragon’s Milk that keep coming out on the market. A lot of the beers on the pub menu I had tried in the past, but there was one I hadn’t and it just happened to be a Double IPA. I picked Art of Chaos. It’s served in one of their 10 ounce High Gravity glasses. It’s a solid Imperial IPA with citrusy and pine flavors. I know the Mad Hatter series is their go-to for IPA’s, but I actually liked this one quite a bit and wouldn’t mind seeing it in bottles. J was hoping to get a Cider and they had two on the menu….but both were out. The waiter actually suggested she try the Blueberry Kombucha which, quite honestly, I never would have picked for her, but she ended up really liking it. 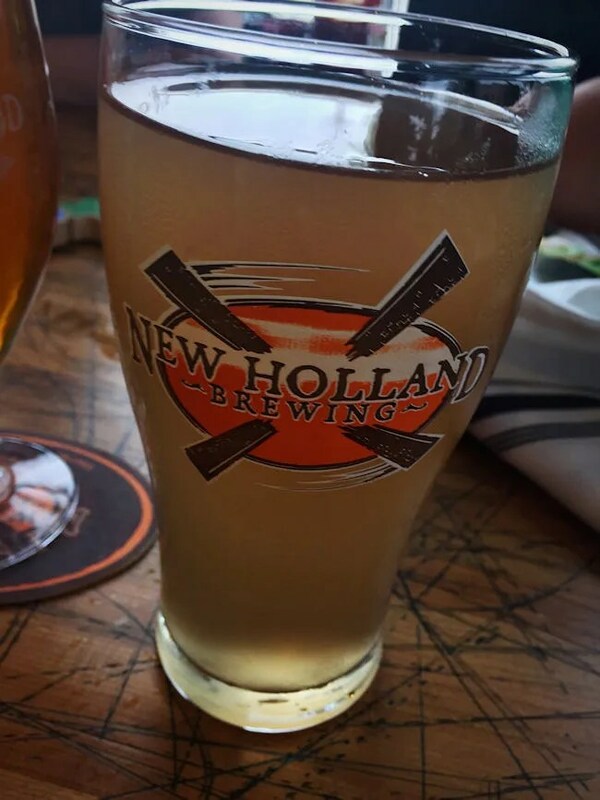 Kombucha ales are pretty new to the craft beer scene and New Holland is actually one of the few doing so. The beer is a kind of like a sour ale but it’s also kind of tea. It’s weird, but J liked it and that’s all I really care about it. 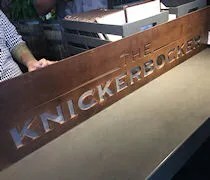 The Knickerbocker has two separate menus for lunch and dinner although they share a lot of the same things. We were in during lunch hour which usually works better for us because we’re sandwich and pizza people not entree people. I was a little disappointed in the one burger option on the menu so I went for something totally different. I ordered the Cudighi Sandwich. The cudighi is pretty much an Upper Peninsula thing. The only time I’ve had it in the past is at the U.P. North Sandwich & Pastry Company in Richland and Allegan. The Knickerbocker’s take on the sandwich is crusty spent grain bread with a thick pork sausage patty in the middle. The sausage is topped with tomato sauce and mozzarella. I just gotta say, I will never get tired of spent grain bread. 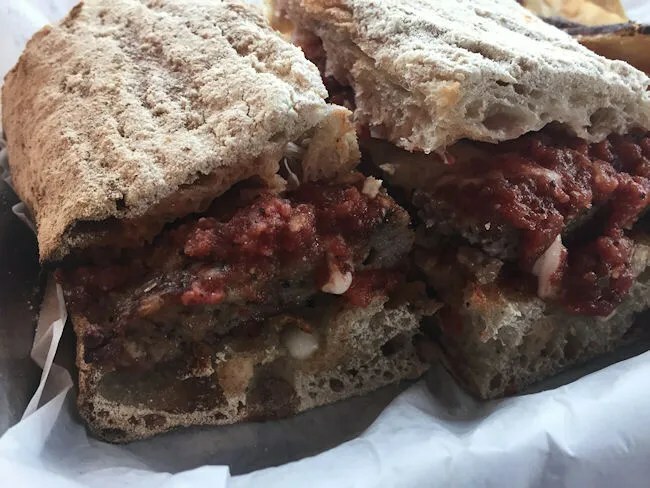 The sandwich was cut in to two smaller pieces, but the greasy pork sausage and tomato sauce made it a little hard to handle. 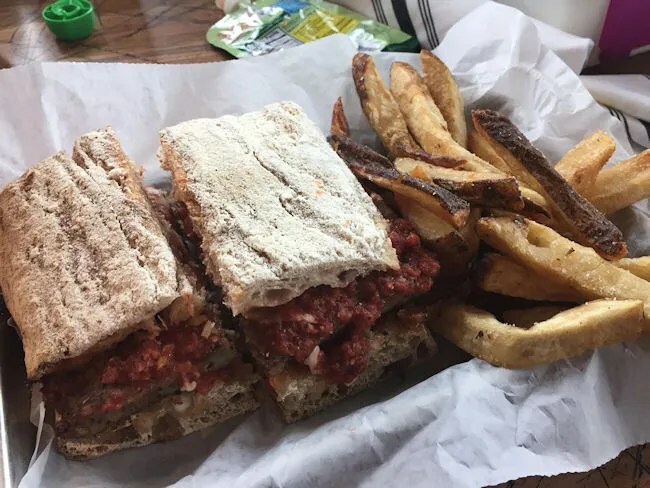 The cudighi is a delicious combination of ingredients you’d normally find on a pizza but in sandwich form. The Knickerbocker’s version is upscale pub food of this simple Michigan classic. The sandwich comes with choice of raw vegetables or fries. I, of course, chose the fries. 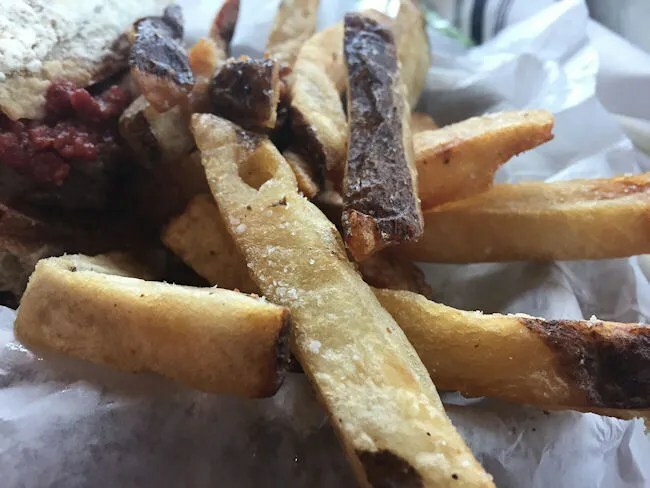 They were delicious skin, fresh-cut fries with just enough salt. The outsides were nice and crispy while the middle was soft and steamy. I shared a lot of these with B and he ate them up like someone was going to steal them from him. J kind of surprised me and passed on the pulled pork sandwich, but that was because she found something she likes even more. 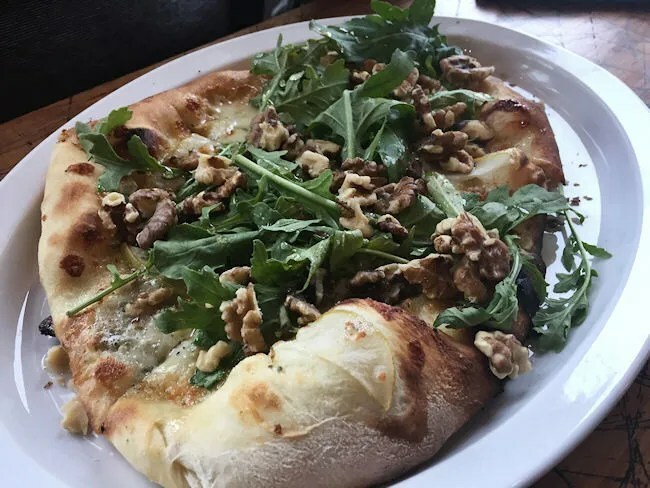 She picked the Pear and Walnut Rustic Pizza. This is one of her favorite pizza combinations. The spent grain crust is topped with pears, walnuts, honey, bleu cheese, and fresh greens. It’s baked in their wood fired oven which gives the crust that really great crispy snap. She’s done this pizza in the past with a balsamic reduction, but said the honey was a really interesting and tasty choice. We didn’t really know what to get L at first and initially just ordered her the Fresh Tomato and sausage Rustic Pizza. We were just going to tell her that the herb sausage was little pepperoni balls, but J decided against it and just asked if she could get a cheese pizza. We figured we’d still have to pay the price for the one with the sausage, but we wanted L to eat it, so it was worth the money. The waiter said they could do a cheese pizza and brought her out what appeared to be a “kid’s pizza” (the table next to us also got one of these). 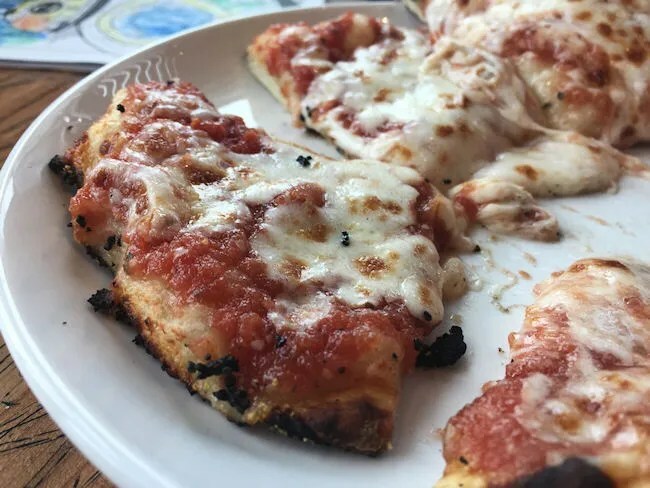 It was made the same crust and tomato sauce of the full size rustic pizzas, but it was much smaller…in fact, the perfect size for L as she ate all but one little piece. The sauce on this pizza was delicious. It tasted very fresh and still had chunks of tomatoes in it. We shared some of her crust with B, but other than that, L went to town on this and really liked it. Our bill for the three meals and the beers came out to a little over $42. We loved The Knickerbocker. Like I mentioned earlier, we’ve always been fans of New Holland so it really wasn’t a surprise that we were going to like it. The building is a work of art and something you really need to see. There’s really nothing else like it in West Michigan. The food was solid and the beer is always great. 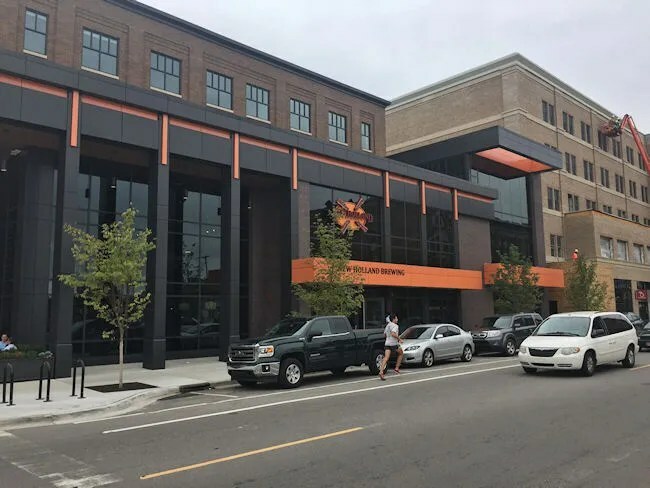 The Knickerbocker is going to be great for Grand Rapids’ West Side.